The main focus of Gweilo's Guide is the extremely zany Hong Kong films of the 80s and 90s. I don't review a whole lot of current Hong Kong movies. But Detective Dee is an exception since it's directed by Tsui Hark, a veteran of the golden era and a true master of extremely silly movie-making. Format Viewed In the Theater! Detective Dee is delightfully absurd. The main “secret” weapon used by the bad guys in this movie is … actually, before I tell you, try to guess. Really. Run anything that could be an evil force's main weapon through your mind, no matter how unlikely. I'll tell you what it actually is at the end of this review. But you'll never guess. In the mean time, I'll run down a few scenes and features of this film that definitely make Detective Dee and the Mystery of the Phantom Flame worth watching from the Gweilo's perspective. Perhaps the script, in its entirety, made sense to Tsui Hark while he was making Detective Dee. If so, he may be unique. The plot is convoluted and complicated, involving lots of crossing and double-crossing and triple-crossing. Also, there's a “technique” that seemed to be all the rage in 689 A.D. which allowed one to entirely transform one's appearance by sticking two acupuncture pins behind the ears. For the viewer, this means that people you think are separate characters might actually turn out to be the same person. If you are paying careful attention to all the crossing and double-crossing, which is admittedly hard to do, you might find that one of the (double) characters actually double-crosses themselves. Which is awesome, because it's definitely one of the most creative plot holes you are likely to encounter. 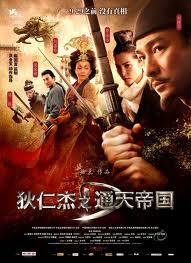 Detective Dee concerns the rise and coronation of Wu Zetian in 689 A.D., the Tang dynasty's first and only female emperor. This is a potentially serious subject, but don't worry; Tsui Hark is on the job. By the way, it's interesting that the Chinese continually announce the year using “A.D.” in the imperial court at a time when China had its own perfectly good calendar, and before the whole “A.D.” thing was widely known in Europe, let alone China. But don't worry too much about the plot, or details like this, because there's tons of very improbable fight scenes to keep you distracted. For example, while traipsing through a kind of underground sewer system chasing after a wise physician known as “Dr. Donkey Wang”, everyone is suddenly attacked by big telephone poles that fly out of the sewer water. Their attacker turns out to be the main spiritual leader of the empire who dresses (unexpectedly!) like he's in the Spanish Inquisition. This spiritual leader is no Pope or Dalai Lama though. No, this guy likes to hang out deep underwater in sewers, and has the ability to hurl telephone poles up out of the depths, a dozen at a time, with enough force to capsize a boat. Try to do that, Benedict XVI! Nobody expects the Spanish Inquisition (to launch telephone poles at you in a sewer)! The same fight scene with the improbable telephone-pole-hurling Spanish inquisitor also includes a fight against robots. Yes, robots. Except these robots look like a combination between the Terminator robot and the French cartoon character Astrix. They've got swords and shields and funny little viking hats and lots of gears. But wait! you say. This movie is set in 689 A.D. There wouldn't be any robots back then! Don't worry, dear viewer, Tsui Hark is right with you on this! The main character, after fighting the robots for a while, suddenly gets a really confused (but thoughtful) look on his face. You can almost read his mind: But wait! he's thinking. This movie is set in 689 A.D. There wouldn't be any robots back then, er, I mean, right now! So he looks up, craftily, above the robots, and he discovers a ledge where some dark-clad figures are busy jerking around dozens of strands of fishing line. These aren't robots he's fighting! They are marionettes! Armed with this knowledge, he applies it right away. He cuts the wires to end the “robot” menace, as the puppeteers conveniently leap to their deaths from the ledge in frustrated suicidal dedication to their craft. 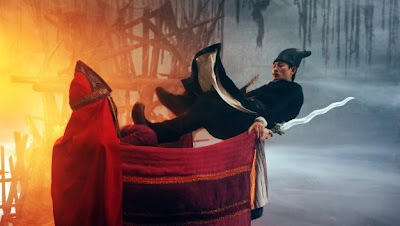 In case you were wondering, Tsui Hark never does get around to explaining why any able-bodied person would choose to fight someone via marionette in the first place. All your strength and dexterity would be spent in lifting up the heavy, metallic puppet on its wires, and making it move convincingly. If you insist on dangling stuff from strings as a fighting strategy, why not dangle just the marionette's sword? Or a heavy iron ball with spikes sticking out of it? Or a hand grenade? (Yeah, Detective Dee has a holy hand grenade at one point!) Or, if you're so well concealed above your foe, why don't you just shoot him with an arrow or drop the sword on his head instead of dangling stuff at him!? More weirdness: There is a talking deer who advises the empress, his mouth sounding out the words with corny CGI. Anton Chekov famously said that if you show a gun in the first act of a play, you'd better have it go off in the second or third act. Tsui Hark apparently took this to heart, but with the deer. We see the deer talking in the early part of the movie, sure, but by the third act we get the deer (and his herd posse) doing kung fu. 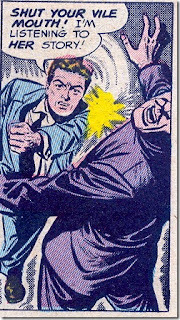 Detective Dee wins this fight by punching the deer right in the face. This is definitely a highlight of the film! There's something inherently funny about the classic, comic book punch in the face, the big wind-up round-house punch right to the jaw that sends the punchee flying over backwards. It's a staple of action comics and corny action movies. But I bet you've never seen it happen to Bambi's mom! The movie also features a gigantic statue of the Buddha towering over the Imperial city. It is described as “66 yards high”. Apparently in 689 A.D. “66 yards” was some kind of well-known code for “at least a mile.” In fact, the statue is so improbably large compared to the city it's in, you will wonder if the height wasn't the result of some kind of dare at the CGI firm. I mean, this statue completely dwarfs all the 19th-century clipper ships that fill the harbor of this 7th-century city! Are you ready to learn the main weapon of the bad guys? It's spontaneous combustion. I bet you didn't guess that. Oh, and the mile-high Buddha statue is another secret weapon, but I bet you saw that one coming.